Direct Cafeteria Tables is your ultimate one stop shop for all of your cafeteria and lunch room table needs. 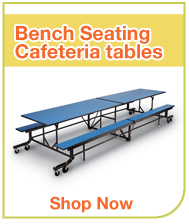 When you shop at Direct Cafeteria Tables you'll find the most affordable selection of lunchroom tables for your school cafeteria or dining hall. 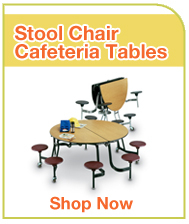 Whether you are looking for stool or chair lunch room tables for your indoor cafeteria or a folding cafeteria table to save on space, we have what you're looking for. At Direct Cafeteria Tables you will find lunch room tables from your basic 12-foot indoor bench tables to cluster cafeteria tables to individual seated stool tables. Our wide selection of indoor and outdoor cafeteria tables features a wide array of products at budget-friendly prices. You'll even find discounts on the most popular brands of tables from Palmer Hamilton, OFM, Norix, Midwest Folding and more! Shopping at Direct Cafeteria Tables is simple and secure - use our search bar, click on a category tab, or call at 1-800-669-7766 to shop for your next cafeteria or lunch room table. Our knowledgeable customer service staff is ready to help you find the products you need.